J’onn J’onzz and Stargirl are the only Leaguers not trapped inside a weird world by their own fears. Separately, they wander from place to place, encountering Wonder Woman, Aquaman, Shazam, Madame Xanadu and new Green Lantern Simon Baz. They can’t be reasoned with. 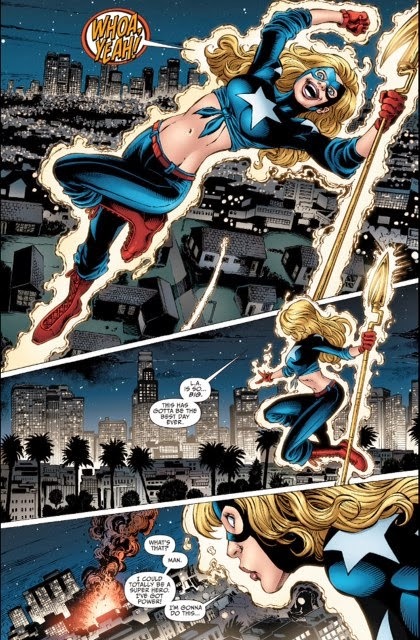 Stargirl searches for J’onn, while remembering her beginnings as a hero. Eventually she finds J’onn fighting a manifestation of his own psyche. 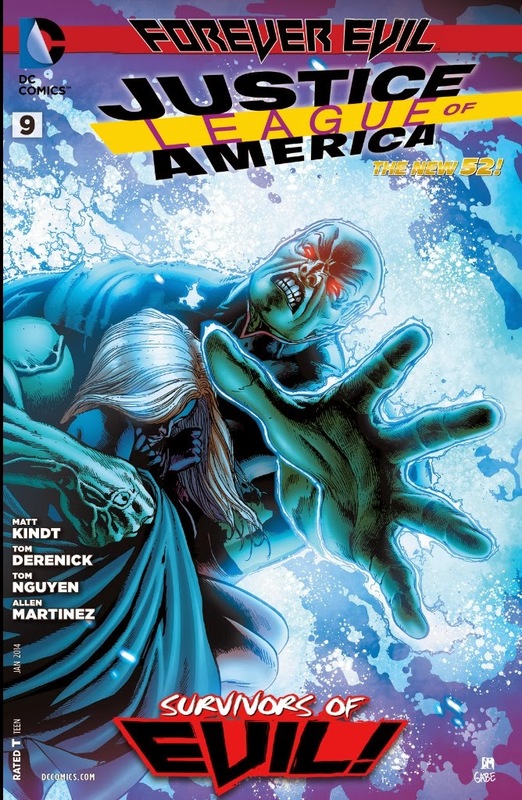 On the one hand, Matt Kindt’s script is a by-the-numbers continuation of last issue’s storyline, with more variations on the theme of Justice Leaguers’ secret fears (Aquaman sees the world’s marine life die; Madame Xanadu must embrace the dark side; Baz becomes the terrorist some people think he is, when in fact the poor dear’s only a car thief). Or perhaps it’s not so much fears as secret desires (Wonder Woman has a never-ending battle to engage her; the Hero Formerly Known as Captain Marvel can smash robots to his heart’s content). I’m not too clear on that point. On the other hand, this almost-throwaway bit of crossover fodder allows Kindt to work on J’onn J’onnz, bringing him closer to the classic, compassionate version than the ruthless guy seen in Stormwatch – an interesting character, but not the Martian Manhunter. And we do get some background on Stargirl, who was introduced a few months ago simply as Courtney Whitmore, teen heroine. Here we see that her origin is pretty much the same as the earlier version of Courtney, when she was the second Star-Spangled Kid – good student finds weapon among stepdad Pat Dugan’s things. The details are different, in that rather than Sylvester Pemberton’s Cosmic Converter Belt she finds the cosmic staff first used, in the previous continuity, by Jack Knight, And rather than make her own costume, she adapts one found in Pat’s trunk. We don’t meet Pat here, and the connection to Pemberton – who has been mentioned in this book – is still to be revealed. But this issue is a start, and Stargirl flying over LA, delighted by her new, borrowed powers, is a moment of pure joy the like of which is seldom seen in DC’s New 52 books. And when she sees that people may need help, she’s straight in there – no angst, no ulterior motives, just the heroic urge (click on image to enlarge). There’s another heroine moment worth showing you, because it made me laugh and laugh and laugh. Penciller Tom Derenick does a lovely job with this Madame Xanadu composition, the tricky perspective works superbly, but combine the image – the previous page’s script suggests that the purple gunk should be coloured red, I’m glad it isn’t – with the dialogue and you get high melodrama the like of which the Victorians would be proud. Yay, it’s Yankee Poodle from Eighties funny animal comic Captain Carrot and His Amazing Zoo Crew. 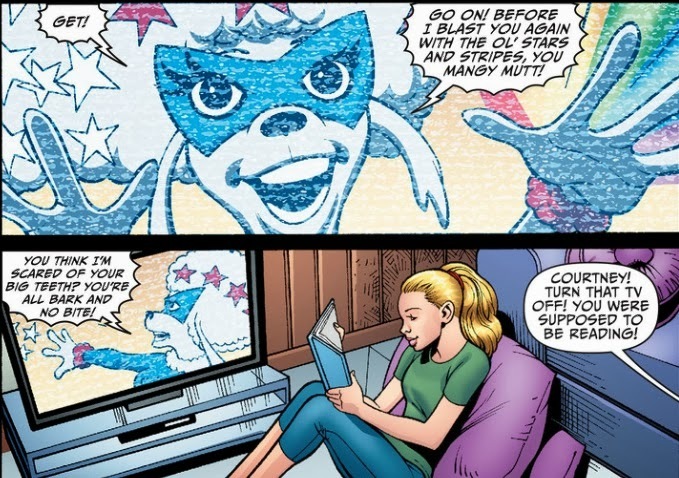 OK, she’s ‘just’ a TV cartoon here, but I know how DC Earths work, somewhere out there a TV writer is receiving dream versions of the real pooch’s adventures on Earth C. I so much prefer this cameo approach to the recently cancelled Threshold’s use of the grrr-tastic Captain K-Rot and Pig Iron. Justice League of America #9 isn’t an essential purchase if only the so-called big stories matter to you, or if you’re watching the pennies. 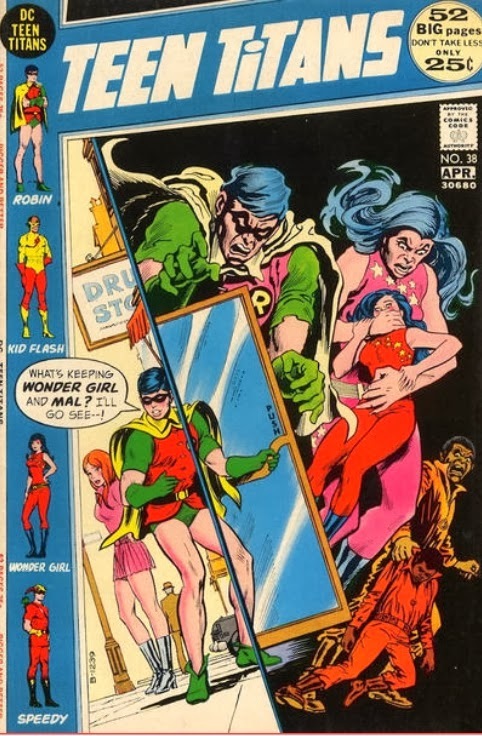 The ‘superheroes trapped by their own psyches’ is an old trope (my favourite spin remains Teen Titans #38, from the days dinosaurs ruled the earth) but I suppose a new continuity is a decent excuse to roll it out again. Really, though, the reason to buy this book is to enjoy Stargirl, a bright new star in the DC firmament. More please. I suppose a new continuity is a decent excuse to roll it out again. Nay, Martin lad. These days (boy, a lot of things sure are getting rebooted) this is a pretty common excuse for new enterprises based on the idea that “well, these characters haven't done X, Y or Z plot before so let's do that now”, but something old hat is still old hat. I stopped watching Star Trek: Voyager around the third or fourth episode when someone said something along the lines of “pretend to be sick and I'll jump the guard when he comes to check.” I actually told my tv to go f**k itself right there and then. A new continuity is – ideally – where you avoid the mistakes of the past and don't just repeat them. I take your point, but maybe there actually are some of these (nicking a term from a clever CBR poster) cryptozoological 'new readers' DC claims who haven't seen this sort of thing previously. Then again, they've likely seen Star Trek, or the final series of the BBC's Being Human, or any number of places the 'I don't want to leave this ideal world' bit has been used. I read and reviewed it over on AiPT and I had enjoyed it quite a bit. I am a big of Star Girl (I have original series on my shelf) and loved seeing her be such an optimist and heroic individual. Heck, its her optimisim and the fact that she is not held by any dark secret or past like a majority of the heroes that ultimately allows her to escape. It's very nice contrast to everything in the DC 52, which has been pretty downbeat (though I am hoping for the new Harley Quinn series to be more light hearted like the writer implies it'll be). Speaking of good female heroes, the recent issue of Batgirl was great as well. Your suggestion for Courtney's mom made me think, “Huh, we don't see many voiceover artists in comics, yet it's a cool profession. Wonder why?” before realizing that their talents are basically impossible to convey in print. Glad to hear Stargirl has retained her optimism! I really like that character. Is that the Zero Year one? It's sitting here … off to read your JLA review first! She did! And it was fun seeing the improvised shirt, very cute!